Anyone wishing to understand the nature of evil can do no better than look within the pages of this book. When Hitler's 'thousand-year Reich' collapsed after twelve years of increasing repression, how were those responsible to be punished? Hitler, Himmler and Goebbels took their own lives to evade justice, but that still left Hermann Goering, Albert Speer, Hitler's one-time Deputy Fu�hrer Rudolf Hess and many other prominent Nazis to be brought before the Allied courts. This is the story of the Nuremberg Trials - the most important criminal hearings ever held, which established the principle that individuals will always be held responsible for their actions under international law, and which brought closure to World War II, allowing the reconstruction of Europe to begin. Paul Roland is the author of more than thirty books, including Reincarnation, Hauntings, Crime Scenes, The Nuremberg Trials, and The Dark History of the Occult. It isn't a bad read, but feels amateurish in places and lacks a great deal of detail. Good to read if you are only after am overview. Easy to read and accurate according to the many other books I've read on the subject. I would have liked the book to be longer and more detailed with more photographs, but that is a minor criticism. It has inspired me to read on! Excellent. We should forgive, but never forget. 3.0 out of 5 starsA Brief summary of the Trials after the WW2 conflict. It's one of those books that tries to cover an enormous topic. Touched on some aspects of the prosecution and the defence of the individuals, but if you have a legal background you'll be sorely disappointed. 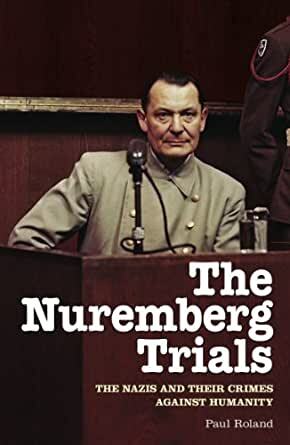 For history buffs, how the trials came about is more comprehensively covered. Overall, was a little disappointed.